On Thursday night, we came out with a lot of fire. Our defense played extremely well, with Pekka Rinne to back it all up. A bit over a minute into the game, Erik Cole got a breakaway chance on Pekka Rinne. It went off the right pad and into the cornor. Pekka Rinne was getting fired up. About halfway into the period, Shea Weber took a pass right off the face off and drilled it at the net. Patric Hornqvist deflected it for his 2nd goal of the year. The rest of the period, our defense was amazing. We kept the puck in their end for most of the period. Right off the bat in the second period, Shea Weber, again, blasted it from the blue line for a goal. About 20 seconds after that goal, the ref called Rinne for roughing. The situation went from bad to worse when Greg Zanon, in an attempt to clear it, shot it out of play and got called for delay of game. Not to mention he hit some guy in the temple and made him bleed like crazy. Shouldn’t have been standing there. 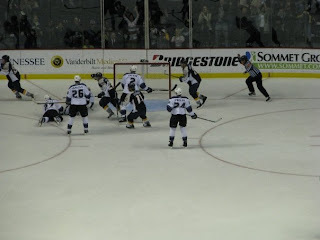 With about 35 seconds left on the 5-on-3, Sheldon Souray shot one that bounced off of Rinne’s side and into the net. A few minutes later, we had two really good chances. Mathieu Garon stayed solid through them, though. We looked really good this period. Almost a minute into the final period, Shea Weber totally laid out Fernando Pisani. That got the crowd going. Ten minutes into the third, David Legwand passed it up to Martin Erat, who snapped it passed Garon. For the rest of the period, Pekka stayed strong in goal and didn’t let another puck pass by him. It was a great performance by him tonight. The 5-on-3 was a bit rough on our penalty kill, but other than that we killed the other three off. Our power-play…again was terrible. There is nothing good to say about our power-play. That’s about all I can think of. The Preds won’t be home again for another 16 days after Saturday's tilt with the Panthers. Again the thought kept running through my head, “Will we keep this lead?” Eventually we pulled it off winning 5-4. Everyone was on the edge of their seat till the fat lady sang. Tonight we got off to a brilliant start 9:32 into the period, while on the power play. Ryan Jones got a pass off of Patric Hornqvist and snapped it passed LaBarbera, after a huge chance on a rebound with David Legwand. A tad bit over a minute later, J.P. Dumont faked out LaBarbera to put one pass his left side. At 12:48 into the period, Ryan Suter took a shot from the blue line which apparently deflected off Martin Erat’s stick to slide passed LaBarbera. The Kings pulled LaBarbera after that goal and replaced him with Erik Ersberg. There were a few more chances later into the period which could’ve been converted, but Ersberg remained solid. Jarret Stoll got two goals back to back in the 2nd. The first goal he scored was from his own rebound. Ellis should’ve had this one. The second goal was scored on a 5-3. Stoll fired one from the hash marks above Ellis’ blocker side. This second goal totally killed the momentum we had gained from the goals in the first. It became a complete re-run of Thursday night’s failure. We were lucky to keep the Kings from scoring again before the period ended. The first ten minutes of the 3rd period were frustrating to watch. It was sloppy play. We would dump the puck into their zone and not even go after it. Finally, 10:54 into the 3rd, Joel Ward gave a pass into the zone for Jared Smithson, who blasted it past Ersberg. This got the momentum going again. A little under a minute later, Jordin Tootoo crashed the net and put a backhander in for the fifth goal of the night and free Wendy’s Frosties. Exactly two minutes after the Tootoo goal, Dustin Brown blew one past Ellis. Our defense was very weak on this one. With 1:08 left in regulation, Alexander Frolov just slid the puck past Ellis. Ellis was completely out of position on this one. Eventually time winded down and we barely escaped with a win. This is two games in a row where we’ve had a burst of goals and then complete meltdown. I’m still happy with the win though. Ellis had a difficult night. Lately, a lot of the goals scored on him are the result of rebounds he didn’t grab. That’s something he needs to spend some time working on. Jason Lababera had a rough night. Three quick goals in the first, game over. Erick Ersberg, for a backup, did alright. He had to come in and clean up LaBarbera’s mess, three goals down. The Pred’s power play clocked out at 2/3. We’re just throwing pucks at the net and letting the trash slide in. Keep it up. Our penalty kill killed off 5/6 power plays, which included two 5-on-3s. I Can’t complain too much with that. Greg DeVries had a terrible night last night. He was completely out of it. Let’s hope that doesn’t happen again. I hope we don’t have to worry about keeping our lead like we have the past two games. It’s very frustrating. The game was exceptionally good last night right up until the 3rd period. Coming into the 3rd, the score was 3-1. The second the puck was dropped to start the 3rd the Predators fell apart. I hope a performance like this never happens again. The 1st period of play was full of power-play chances. Miikka Kiprusoff had an amazing 1st period, seeing as how half the period was played on the power play for the Preds. The 2nd period is when everything started to heat up. At 5:42 into the period, Greg Zanon took a pass off of Klein and slapped it top shelf for the first goal of the night. Right after that, 6:01 into the period, Jerred Smithson dropped the puck back for Jordin Tootoo who put a nice shot past Kiprusoff’s blocker. After that, at 8:10 into the period, David Legwand passed to Shea Weber, who fed it to J.P. Dumont who centered it for Jason Arnott who sniped it passed Kiprusoff. Hot off those 3 goals in a 2:28 time period, everything looked good. 14:04 into the period, Jarome Iginla netted one top shelf for his 3rd of the season. At the end of the 2nd we still looked in pretty good shape for a win. This is when we started to look tired and incapable of holding our lead. We were able to hold them off for almost seven minutes before the flood gates were opened. 6:52 into the 3rd, a shot from the blue line got a bad rebound and Jarome Iginila got clocked in his second goal of the night. At this point, I was starting to wonder if we were going to keep the game in regulation or even lose. A little over a minute after Iginla’s goal, the same circumstances showed up again. A shot from the blue line with a bad rebound turned into a goal. David Moss was standing right in front of the net and got the rebound. A notable save that Ellis made was with 4:44 left in the 3rd, it was a wide open net and he got the tip of the stick on the puck, just enough to stop it from going in. 12:30 in, the Flames got another goal. Dion Phaneuf Blasted one from the blue line and Mike Cammalleri redirected it through the five-hole of Dan Ellis. Once they took the lead I knew there was no coming back. The next seven minutes were a drag to watch. To finish off the game, Jarome Iginla scored on the empty net for his first hat trick of the season. This 3rd period was a mad house. Awful performance. We were 1/5 on our penalty kill tonight. We’re now ranked at 28th overall on penalty kill. What happened? We went 1/8 tonight on the power play. Ranked 24th overall in that category. Let’s get it together huh? Ellis had a rough night. He let too many rebounds in for one night. I won’t put it all on him, seeing as how the defense was non-existent in some of the goals. I expect to see a quite a bit more from him. Nick Tarnasky made his Predator debut last night. Within the first ten minutes he mixed it up with Brandon Prust. He also recorded his first point with an assist on the 2nd goal. Go Nick. The Calgary Flames visit the Sommet Center to match up against the Predators tonight for their first meeting of the year. The game features a roll call of young defensemen from the 2003 Draft that was held in this same building. The Predator’s Ryan Suter (7th pick overall), Shea Weber (47th), and Kevin Klein (37th) will square off against Calgary’s Dion Phaneuf (9th overall). Dion Phaneuf has long been considered one of the leagues best while Weber, Suter and Klein have yet to meet the high expectations that were set for them early on. Shea Weber has taken a few giant steps this year in giving the Preds what has been expected of them. He currently is tied for the team lead in points and goals, highlighted by last Saturday’s four point – plus 5 performances. The Predators will also welcome newcomer Nick Tarnasky to the lineup for his first game as a Predator. With his thumb out of a splint, expect to see some early fisticuffs to set the stage for the evening. Captain Jason Arnott is also expected to return after missing three games with a broken finger. This raises the specter of who will sit out tonight’s game. I would expect that Kevin Klein will get the nod over Ville Koistenen due to the size of Calgary’s team. With early season surprise Joel Ward practicing with the first line yesterday I would also expect that Patric Hornqvist may buy some pine time tonight. Wards presence with Arnott and Dumont would add a different dimension to the first line pair that are in their third year together. The other person sitting is anyone’s guess possibly Radek Bonk, Jerred Smithson or someone who get’s in Barry Trotz’s doghouse during the pre-game skate. With as many players with similar talent this year when there are no injuries there will be a lot of close calls on who plays and who sits. The final key to tonight’s game will be to watch how much jump the Predators have from the opening puck drop. With longer layoffs the Preds have returned to the ice fairly sluggishly at times in the last couple of years. Also, with the tendency for first period defensive lapses in a few games this year it will be important for the Predators to be on top of their game right at the start. So let’s drop the puck and go get ‘em Preds! Team Notes: Joel Ward has been advised leave his hotel room and to get an apartment which is a good sign that he will be here for the duration. So far he has surpassed all expectations… If Hornqvist sits tonight it will not be as much for poor play as it will be to give him a break from the high expectations that were set for him prior to training camp. He has played well so far and will only get better…. Look for Ryan Jones to be a key in tonight’s game. His minutes have increased nightly along with his confidence. Trotz was vey high on his improvement on an NHL Home Ice interview yesterday…. Trotz also seemed more confident than ever that Steve Sullivan will play again this year. I stick by my assessment to not believe it until you see him on the ice. The Nashville Predators have completed a blistering early season run playing six games in nine nights and currently sit tied for sixth in the Western Conference. The Preds are off until a couple of home games Thursday and Saturday against the Flames and Kings. If you simply look at what the Predators have done on the stat sheet even the most Pollyanna of the Pred Nation would be screaming that the sky was falling. Through Sunday, the Preds have given up 22 goals, second only to the Dallas Stars. Their penalty kill which was their bread and butter last year (finishing 3rd) was 25th in the league at 73.3%. The power play which was thought to be much improved was 20th in the league at 13.8%. The very inexperienced goalie corp was 25th in the league with a 3.67 GAA and a team save percentage hovering around 86%. The seemingly strong defense has taken a powder a few times in each of their three losses leaving the goalie outmanned and open to several back door goals. None of the information out lined above looks like it would belong to a team headed for the playoffs even this early in the season. On the bright side the Predators are second in the league in goals scored, not bad for a team considered to be scoring challenged. Eighteen of the twenty players that have dressed have contributed a point including 14 with at least one goal. They have also been playing without the one player they probably can least afford to lose, Captain Jason Arnott who has a broken finger. The Preds have also been playing without a true enforcer with the newly acquired Nick Tarnasky still out with a broken thumb. That has lead to some very embarrassing moments in the area of pugilism, the worst of which was probably Jerrod Smithson getting owned by Andre Picard last Friday night. Both Arnott and Tarnasky are expected to return on Thursday. The highlight of the season so far had been the reemergence of Shea Weber as the dominant defenseman that has been expected of him for two years. Slowed by injuries last year he has returned with a vengeance leading the team with seven points, a plus 4 rating and second in ice time with over 24 minutes per game. His coming out party was Saturday night against Columbus where he was a true dominant force scoring a goal, adding 3 assists and ending up with a plus 5 rating. The biggest question at the start of training camp was who would file the three or four open roster spots from a group of prospects and rookies. The answer was Patric Hornqvuist, Ryan Jones and Joel Ward. Patric Hornqvist has looked like a solid player since the start of camp and has been spending time on the first line and even taking shifts on the power play unit. Jones was shaky in his first game of the year and bought a night of pine duty in the process. Since then his confidence, production and ice time has grown nightly. One of his assist against Columbus started one of the most amazing plays I’ve ever seen. After a drop pass to Mary Erat, Jones skated straight at goalie Norrena completely screening him from Erat’s shot which went through Jones’ skates and Norrena’s five hole. The camp’s biggest surprise has been Joel Ward, a completely unheralded minor league free agent who played in Houston last year. His grit, determination and defense has made him an instant Barry Trotz and fan favorite. He has picked up two goals and an assist while becoming a staple on an already excellent penalty kill unit. The Predators schedule is not particularly friendly until American Thanksgiving week. 13 of their first 20 contests are on the road. They have already played three home openers on the road. If the Predators can continue to come together as a unit, stay injury free, and play a few games over .500 in their first quarter of the season, they should be in good shape to make another run at the playoffs. Pred Notes: Don’t believe a word of the Steve Sullivan returns rumors being repeated on NHL Home Ice 204. Sully has played his last NHL game and will never return… Jed Ortmeyer’s return is somewhat more optimistic probably within a month or so. His biggest issue will be finding a spot on an improved roster… It is still surprising that Martin Gelinas has not found a home this far into the season. I hear he is game ready and working out daily with a Canadian college team. After a slow start in Columbus on Friday night, the Nashville Predators came ready to play on Saturday with a 6-3 victory over Columbus. The game was a great hockey night in Nashville game for the Preds and the sparse crows of 13,000 that was there to see it. There was plenty of scoring (including a third period with a combined 30 shots), Much better defense on the Preds part, and a couple of fights as you would expect in any Blue Jackets game. The night was also a coming out party for the new look Shea Weber. Shea scored a goal and had three assists and end up with a plus 5 for the night. He also had five shots and three hits for good measure. After an injury plagued season last year, Weber played to the high expectations that folks have had for him the last couple of years. He was the first star of the game and I don’t see how the didn’t make the NHL top three. The one’s picking the NHL stars obviously forgot to watch the tape of the game. Several others had big nights including Marty Erat who had two goals and flirted wit h a hat trick several times the second half of the game. His first goal was one of the most incredible plays I have ever witnessed in person. Rookie Ryan Jones was taking the puck down ice and faked a slap shot as he crossed the blue line and left Erat with a drop pass. Jones then skated directly at goalie Fredrik Norrena’s mask completely screening him from the puck that Erat sent through Jones’ five hole as well as Norrena’s five hole for the goal making it 2-0 Preds. Jones was interviewed on the post game show and verified that it was a planned move on his part. Erat made it more interesting by sending it through Jones legs. That part wasn’t planned. Dan Ellis continued to play well in goal in spite of letting three shots into his net. The Predators defense looked much better than in Friday’s game as did the penalty kill which allowed no goals. One positive thing that can be said for this season’s Columbus team is that this is the most competitive team they have ever put on the ice. The Nash, Umberger, Huselius line is the best line they have skated in their history. With the goalie tandem they sport and the youngsters they are bringing through the system they should be a force to be reckoned with over the next few years. After the Predators big night, they will get a few days without any games. They played six games in nine nights compiling a 3-3 start and will now get a few days to go back to the basics to prepare for home games Thursday and Saturday against the Flames and Kings. Hopefully Jason Arnott and Nick Tarnasky will be ready to return after the days off. The Preds play 13 of their first 20 games on the road up until American Thanksgiving week. If they can play a few games over .500 until the end of that stretch, they should be poised for another playoff run. The Nashville Predators returned home late last night without the baggage of the 16 game point streak versus Columbus. They were run over by the Blue Jacket express which seemed to have everything go their way on offence and defense. The Jackets ran starting goalie Pekka Rinne with two goals in 8 seconds late in the first period and then added another power play goal at the start of the second period to go up 4-0. The Predators decided to wake up at that point and scored three unanswered goals , including two in 9 seconds to end the second period down 4-3. Columbus sealed the deal midway through the third with their second power play goal. The Preds had scoring chances all night long but were stymied by Pascal LeClair time after time before he left the game late with a hand injury. The third period was also marred by a fight that should have never happened. Jerred Smithson tangled with Andre Picard and was immediately taken to the ice. One of my pet peeves is when people that aren’t fighters try to do the job of an enforce. There is never a good result and there is always a better than average chance of injury to a player who is key to his team. At the risk of sounding like an old school Vanderbilt fan (before they got good this year), in spite of the loss it was a moral victory of sorts for the Predators in that they were able to come back in the midst of a potential blow out on the road and make a game of it. Tonight should be a different story at home and hopefully with the Predator debut of enforcer Nick Tarnasky. If he is able to go and his hand is healed well enough, expect to see blows within the first five minutes of the game to let the Blue Jackets know that last night was a fluke and they had better get ready for another streak. After a two win, two loss start that may be better than the record would indicate, the Predators return to action this weekend with an old school NHL home and away series with division foe Columbus. The Pred’s 16 game point streak against the Jackets is on the line with the Preds sporting a 15-0-1 record over the last two seasons. On paper Columbus should have a better team on the ice this year so the streak will probably end this year. Predator – Blue Jacket games are always spicy affairs with an abundance of bad blood and the resultant fights. This weekend’s set should be no different. It is disappointing that the Preds don’t have a true enforcer to dress in the series opener tonight. Nick Tarnasky who has been sidelined with a hand injury since his arrival in Nashville will not play tonight but may be cleared by the doctors for tomorrow’s rematch. The Preds PIM leader so far is the unlikely Dan Hamhuis, wit all of his 17 minutes stemming from his response to being mugged by Dean Avery last week. I feel sure Jordan Tootoo will receive the brunt of the Jacket’s ire before the weekend is out. The goaltending duties will be split with Pekka Rinne going tonight and Dan Ellis in the net for the home crowd on Saturday night. Jason Arnott will not play this weekend but hopefully will return by next Thursday’s game with Calgary. Ryan Jones will get a couple more starts in the lineup due to Arnott’s absence. After a very nervous appearance last Friday and taking the pine on Saturday, he returned for much better games against Chicago and Dallas. While taking the loss against Dallas on Wednesday night, the play of Jones and Patric Hornquist was encouraging with both scoring their first NHL goals and both looking more comfortable on the ice. With Arnott out, Trotz has been going with a first line with Radek Bonk at center and Dumont and Hornquist on the wings. Erat, Legwand and Tootoo; Fiddler, Nichol and Smithson: and Peverly, Ward and Jones have made up the other line combinations. It is unclear who will be the odd man out on defense tonight but I anticipate that Kevin Klein will return tonight with Koistenen sitting. In summary, it’s great that hockey is back in season and that we have a full slate of games to look forward to on a Friday afternoon. Let’s go Preds and bring in four points this weekend. I’m just going to go ahead and start off with a rant. The once famed “Zooperstars” were supposed to perform during each of the intermissions. The first intermission they came out with Whale Gretzky and a few other no-namers. All they did was spin around in circles. It was a very poor performance on their part. The seconds intermission, they came out with some people no one even knew, other than Mario Lemule. It was an all-around lame presentation. I still <3 Lemule though. The Preds were looking really good last night. They were passing good, taking shots, and a good job on D. The three stars starting from three were: Dan Ellis, J.P. Dumont, and Jason Arnott. Arnott with two goals and one assists and Dumont with 3 assists. Ellis stopped 19/20 shots. Ellis had an improvement from Friday night. Most of the problems on Friday were caused by the D not doing their job. But two of the five goals scored were easy ones that should never be let in. Last night the one that went in was just terrible. Luckily, he didn’t let any others in. I hope he stays strong. Our penalty-kill was perfect tonight, no goals were let in. Keep up the good work. Last night, our power-play was fairly good. We got two of our goals on the PP. There were a lot of chances tonight that could’ve been converted. I’m happy with two for now though. It seemed like J.P. Dumont was everywhere tonight. He had a terrific game. I saw him in the Verizon Wireless store about 6 months ago. His wife wasn’t too happy that night..
One player that really just didn’t show up was Kevin Klein. He made tons of bad plays. He looked like a fish out of water. He did play very well in the pre-season. Our team is looking really good this year. Let’s keep up the good work! After one of the worst performances by a Nashville Predators team in their opening game the Preds limp back to the Sommet Center looking for a much better result tonight against the Dallas Stars. Other than Ryan Suter's goal on the Preds first shot of the season and the continued excellent play of newcomer Joel Ward (which included his first NHL goal) there was little to write home about. Considered to be the strength of the team, the defense again fell flat on their face. After having sported the league's third best penalty kill last year, the Preds gave up four goals on seven shots. Their power play was equally bad with zero shots on four man advantage opportunities. Barry Trotz felt like Dan Ellis had a great game which is hard to believe for a goalie that gave up five goals on 22 shots but Ellis was hung out to dry all night and the score could have been much work without his unruffled play. Thank goodness the Preds get to play again tonight with a chance to redeem themselves quickly. Dan Ellis is expected to be in goal again. It will be interesting to see if Trotz reinserts Radek Bonk into the lineup after being a healthy scratch last night. Trotz has been on the warpath for over a week about veterens who weren't playing to their potential so I guess Bonk must have been one that he was disappointed with. I would imagine that Kevin Klein will also find his way into the lineup tonight after having an excellent preseason. Former captain Greg Johnson will drop the puck during opening ceremonies in a sold out Sommet Center. The crowd will be ready to rock as a fierce hatred of the Stars has developed over the years. The intensity was especially aggravated by the Tootoo-Modano-Robidas incident a couple of years ago when Tootoo cold-cocked Robidas and was then violently struck by Modano who brought the stick in a violent over head wood chop blow to Tootoo's back. (Check it out http://www.youtube.com/watch?v=upeLPWApt6w) Dispite the fact this was the game that Modano tied the record for most goals by a US player, Modano never even received a 2 minute penalty while Tootoo was suspended. That still makes my blood boil that Modano didn't get a penalty. So with that said, I'm fired up and ready to see some hockey. With Tarnasky on the IR it will be interesting to see how the Predators will handle any rough play which will be expected as always when these two teams meet. We will see in just a few hours because it is Hockey Night in Nashville! Since opinions are like rear ends (everyone has one) it’s time for me to give my predictions for the 2008-2009 season. Several teams look different on paper but fortunately the season is played on ice. As the headline states, I can’t foresee anyone overtaking the reigning champs. The Wings lost only Dallas Drake and Dominique Hasek from the Cup team. They more than replaced the pair with Marion Hossa and Ty Conklin. I also don’t buy into the “Cup hangover” argument that everyone is making to try to say the Wings won’t repeat. They are one of the best coached and disciplined teams in the league. I will make specific predictions of all thirty teams by conference. Additionally, in parenthesis I will project a range of where each team will finish from what I feel is the best they can finish if everything falls into place and the worst they could finish if the bottom falls out for them. Please note, my predictions are on total points and do not take in consideration a third place finish for division champs. 1. Detroit Red Wings (1-2) As stated above the Wings should have no trouble repeating. Their point total will also be buoyed by being in the weakest of the three divisions out west. 2. Dallas Stars (1-4) The Stars came on strong in the playoffs last year and if the new additions blend in early in the season the Stars should be able to challenge the Wings for the conference title. Steve Avery’s feistiness should add a new dimension of the Stars normally business as usual approach. One thing that is a drawback in the West division is that includes three of the top five or six teams in the entire league. 4. San Jose Sharks (1-6) The Sharks will be an interesting team to watch as the season unfolds. The team had been picked by many to compete for the cup the last couple of years but never played to their anticipated level. With a fresh start under a new coach and most of their skilled players returning this could be the year for them to live up to their potential. Many new faces on the blue line will have to learn to play as a team quickly. It will be interesting to see if coaching has been the issue or if the players simply are not as good as folks have been led to believe. 5. Calgary Flames (4-9) The Flames appear to be the most solid choice among a very competitive group in the Northwest division. I don’t see anyone in the division being able to break free from the rest. I think we will see a tight race like last year with any of the five actually capable of winning the division if things come together for them. 6. 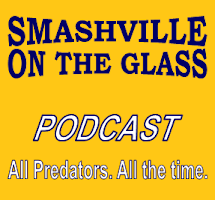 Nashville Predators (5- 10) Could this be the year for the Preds as the NHL ad says? Obviously I am somewhat biased and optimistic since the Preds are my team but I’m also realistic enough to consider that if the goaltending falls flat on its face and few goals find the net that the Preds streak of four years in the post season will come to an end. Since day one of the Preds, long time under recognized coach Barry Trotz has done more with less than any other coach in the league. Last year after the Preds’ “fire sale” Trotz was able to do what few thought he could getting the Preds into the post season with much less talent than the 110 point team of the year before. With the loss of Radulov and the burden of the world on Dan Ellis Trotz hopefully has a few rabbits left in his hat. More pluses in the Preds favor is that they have plenty of cap space, stockpiles in the minors and plenty of picks in the 2009 draft. 7. Minnesota Wild (5-10) The middle group in the west this year starting with #5 Calgary above all the way through #12 Colorado are in a group that are all capable of making the playoffs if things go their way. The Wild are a team that may have fallen off a little versus the competition in their division but should still have enough to sneak into the playoffs. 8. Chicago Blackhawks (5-11) The Hawks were very active in the off season with several veteran acquisitions to solidify themselves in goal and on the blue line to go along with the young scoring talent that has developed over the last couple of years. If they get off to a slow start, I wouldn’t be surprised to see an early coaching change after all the off season moves. On paper they look like a playoff team but it may take time for them to play as a cohesive team. 9. Phoenix Coyotes (7-12) The Desert Dogs have my vote as the most improved team in the west since last year. Unfortunately they are playing in the toughest division in hockey. A key to watch is how they perform in the 18 games vs the Eastern Conference. Success vs the East over 18 games could offset the really tough 18 games they have to play against the division’s top three. A mix of good veterans and young future stars will make this team competitive every night. 10. Vancouver Canucks (6-12) The Canucks improved their scoring potential over the summer and should be able to field two solid scoring lines if everyone stays healthy. As long as Captain Luongo plays his 65-70 games and stays in top form they will be a contender for a playoff spot. The Nooks had a good preseason so it will be interesting to see if that will continue when the puck drops for real. 11. Edmonton Oilers (6-12) Edmonton has also improved themselves over the summer an has several youngsters that should be ready for break out years. I’m still not impressed with the duo in goal. Over the last couple of years it has been hard to believe they are only recently removed from the cup final. The playoffs are in reach but things will have to fall in place early for them to be successful. 12 Colorado Avalanche (8-14) The Avs are another team that will be a step slower than they were last year. With several older veterans and younger players that did not meet expectations last year the Avs will need to take it up a notch to make the playoffs. They will need a return to form by Ryan Smyth and a break out by Wolski and Stasney to go to the postseason. The play in goal has potential to be problematic and contributes heavily to where they are ranked. 13. Columbus Blue Jackets (9-14) On paper the Jackets should be much improved with addition of a couple of scorers to go with Rick Nash. LeClair should be solid in goal as well. For some reason the BJ’s have consistently underachieved with what they have had. I have really expected more from a Ken Hichcock coached team than I have seen since his arrival. With more weapons this year this will be his best shot but I still don’t see a playoff birth this year. 14. St Louis Blues (11-15) The Blues seemed to have been snake bit in the recent past. A golfing accident to Erik Johnson who was set to bloom this year is indicative of how things have gone for them recently. Legacy and Mason will have to be stellar every night for the Blues to compete. More is also needed from several aging scorers than we saw last year. I don’t think they will fall below the Kings but it could be close. 15. Los Angeles Kings (14-15) I can definitely say the Kings have a lock on last place in the west. I don’t see anything on the horizon that would indicate any upward movement in the standings. They parted with several solid veterans and replaced them with similar talent. The younger base is still a year or two away from lifting the Kings out of the basement and that will insure another top draft pick next summer. 1. Montreal Canadians (1-4) I’m picking the Habs to win the Eastern Conference but don’t really feel good about doing so. The West has at least four teams that are better than the best the East has to offer. The Habs were good last year and look to be better than Pittsburgh on paper. The East probably has numerous teams that could challenge for the title due to parity but none that will chase the Presidents Trophy. If Carey Price fails to play well, the Habs could take a significant dive in the standings. 2. Pittsburgh Penguins (1-5) As sure as I was that the cup hangover would not affect the Red Wings I am equally sure that the Pens will feel it. They have a much younger team and lost several key players from their run to the finals last year. I am still not a big fan of Marc Andre Fleury and was really disappointed with Malkin at times in the finals. They still have a lot of firepower and should be able to out score opponents on most nights. 3. Washington Capitols (1-5) The Capitols should pick up where they left off at the end of last season. If they had better goal keeping (even a top 10 goalie) they would be my number one pick in the East. They can score in bunches bit with Theodore in goal the other teams will too. They will benefit by playing in the Southeast division. A.O. should repeat taking home a mass amount of hardware. As far as I’m concerned he is the number one all round player in the game. 4- New Jersey Devils (2-6) On paper, I shouldn’t rank the Devils this high but they are the most consistent team in the East over the last decade and beyond. All they do is win. They have a solid team, great goalie and a coach that doesn’t know how to lose. As long as Brodour stays healthy they should be in the mix to win their division all year. They are not always fun to watch but they always are in the post-season, something that 14 other teams don’t have a chance to do. 5. Philadelphia Flyers (2-7) The Flyers have a good young team that should finish in the top three in the Atlantic division and should easily qualify for the playoffs. They came on strong at the end of last season and should pick up where they left off. They have a good combination of speed, grit, scoring and youthful enthusiasm that should keep them in the playoffs for years to come. 6. Boston Bruins (5-9) The Bruins were back in the playoffs last year and appear to be poised to pick up where they left off. Tim Thomas proved himself in goal and the team competes every night in a tough division. With the return of Manny Fernandez they will be strong in goal. They will need to play well as a team in order to make it past the first round of the playoffs. 7. Ottawa Senators (5-10) Despite the free fall at the end of last year, the Senators should have a new optimism (less the disgruntled Ray Emory) and have a good shot to return to the playoffs this year. Their top line should score with anyone. The combination of speed and regaining the memory of how to win should keep them in the top three in the division. 8. Tampa Bay Lightning (7-12) The Lightning did more over the summer to grab headlines than any other team. With the return of Barry Melrose and all the new players, they will need their names in tape on the front of their helmets for well into the season. They have plenty of talent but I’m not sure Melrose can perform as well as he could talk on the TV. Picking up Kolzig may be the best addition they made if the unproven Mike Smith struggles behind a revamped blue line. This is a really hard pick and it will be a real challenge for the team to play as a unit early in the year. 9. New York Rangers (7-12) The Rangers have the best chance to take the biggest fall in the East this year. They play in a tough division and appear to be the fourth team and will finish out of the playoffs. They lost several key players that defined the team and should struggle out of the gate. Their strength in goal should keep them competitive on a nightly basis. 10. Carolina Hurricanes (8- 11) The Canes had relatively little movement during the off season for a team that finished two points out of the playoffs. Two teams will make the playoffs out of the southeast and it is hard to pick which one the second team will be. The canes appear to be a player or two away from being able to assure the 8th spot this year. Cam Ward will need to step it up a notch for the Canes to play into April. 11. Buffalo Sabres (8-12) I really would like to see the Sabres back in the playoffs but wouldn’t feel comfortable picking them there at this point. They have a similar team to the one that finished 10th last season and did little to improve their position. Miller should be strong in goal and they should score plenty of goals but I don’t see who they could move out of the playoff picture in their division. 12. Florida Panthers (10-13) The Panthers had significant turnover during the off season. They had wholesale changes on the blue line and lost some of their limited scoring ability. Several folks feel that they have a shot at the playoffs but even in a weak division I don’t see it. 13. Toronto Maple Leafs (10-14) I really feel sorry for fans in the hockey Mecca of Toronto. They really have very little to look forward to this year other than the possible signing of Brian Burke at the end of the season. The team will probably muddle along mired in mediocrity and probably lead to a few crying injected interviews by new coach Ron Wilson. If he could cry for the cameras in San Jose, the Leafs will give him plenty to cry about this year. It’s a good thing the Preds didn’t move to Hamilton because they would take the spotlight away from the Leafs. 14. Atlanta Thrashers (13-14) The Thrashers are a team with no apparent plan throughout their history. Ilya Kovalchuk it the shining light in a cast that doesn’t have many stand outs. Kari Lehtonen should be a better goalie than he has shown in the past but has been burdened by a weak defense and a series of injuries. The trade of Hossa last year diminished the Thrashers even more. They are definitely not better after dealing one of the best scorers in the game. I guess the theory was that they could finish near the bottom with or without him. 15. New York Islanders (15) The Islanders, like the Kings, have little to look forward to this year other than next summer’s draft. Unlike the Kings they don’t have a young base of talent to even be able to chant “Wait ‘till next year”. Amidst all the distractions of my friends being on fall break and constantly ringing the doorbell and the internet going on and off, I’ve decided to lock the doors, close the blinds and try to write a season preview. Over this pre-season, I’ve noticed our penalty-kill has stayed strong over the off-season. They only let five goals go in on 49 power play chances for the other team. I’d say this is going to be another good penalty-killing year. Although, we should cut down on the penalties. Most of the ones we’ve taken have been really stupid, emotional penalties. Our power-play on the other hand, is looking dreadful. On 62 chances, we only converted on six power plays. Sounds like a repeat of last season’s power-play. Watching the Preds on the power-play is frusterating. They either pass to much and only get one shot on goal or they end up taking a stupid penalty to make it 4-4. Gosh. This pre-season, our blue line has been producing a lot of goals. Last year we struggled with this, especially on the power-play. Last season Barry Trotz said this was an area we needed work in. I hope this can continue throughout the season. This will definitely help us out in the future. One player that has really proven himself is Patric Hornqvist. He has been snapping necks and cashing checks. He’s been producing goals and drawing penalties. This kid is going to be awesome. The enforcer position is still up in the air. If Tarnasky remains injured, Josh Gratton might take the positon for that time. I guess we’ll just have to see how this one will play out. Joel Ward is the likely candidate for staying up here, but I would like to see Antti Pihlstrom stay up. He’s like Scotty Nichol times three. He’s very agile, he can produce goals, he’s awesome on the penalty-kill, and he’s got an awesome haircut. Joel Ward also does pretty good on the penalty-kill. Ward scored 2 goals in this pre-season. His +/- was also fairly high. Let’s hope the coaches pick the right one. I think if our blue line can continue to produce goals like they are right now, our vets can come back and put out a strong effort, Ellis and Rinne hold up in net, and we stay healthy, we could be a big contender this year. Hope hope. Federal Bailout for the Predators? With all the hundreds of billions of dollars being tossed about frivolously by our elected representatives in Washington, why has "Boots" and the Predators not been in line with their hand out seeking bailout money? 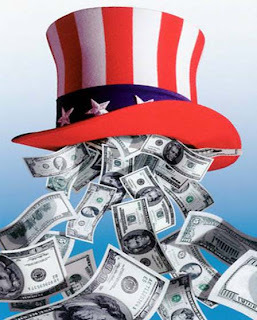 What is the difference between DelBiaggio's bad loans and those of the mortgage industry? Bad paper is bad paper. "Boots" only has a small debt in comparison to the banks so why not throw a little change his way? Reading this you may think this is a silly thought, but after watching all the clowns in DC over the last couple of weeks this is as worthy a cause as any. Think about it! The PredsOnTheGlass duo are tired and cranky and seriously Jonesin’ for some hockey action. I can’t believe that the NHL in their infinite wisdom send four teams all the way to Europe and can’t manage to get the opening two games on some form of US television network that can be seen outside of the teams local markets. If the league is serious about the European market and wants to sell the idea to the North American fans they might want to make the games available for all to see. Knowing that the season opening games are being played as I write while I’m holed up in a rat hole of a motel watching a UWV-Rutgers football game is making my blood boil. Speaking of a rat hole motel, I would not recommend the Days Inn in Fairmont West Virginia to my worst enemy. The whole operation is basically third world. After a nine hour ride for a midnight arrival last night and having paid in advance and called twice confirming we wouldn’t have problems with a midnight check in, the Days Inn still screwed us. The manager was completely unaccommodating and even acknowledged that they screwed up and still did nothing but offer to refund our payment. That brings us back to why we are at the Days Inn anyway (before anyone says if you go to a Days Inn you deserve whatever you get). My stepson is getting my married and because of the above-mentioned UWV football game everything within fifty miles is booked (except for the worst hotel in North America). Returning to hockey, the highlight of the nine-hour car ride last night was listening to the Preadors – Thrashers game on the XM Radio. Best I could tell, the Preds started the game about the same way they did Thursday having massive problems moving the puck out of the defensive zone and down the ice. After a couple of quick early goals by Vern Fiddler and Dan Hamhuis the Preds turned the puck over repeatedly leaving several odd man situations that Pekka Rinne had no chance to defend. The Thrashers scored four goals in seven minutes two on the PP and one short-handed. It is really hard to understand why his puck moving issue has surfaced in the first period the last two nights especially since the regular D-men have been the ones with the problem. After a scoreless second period that featured fights by Tristin Grant and an all-star thrashing of a 12 inch taller Boris Valabik by Jordan Tootoo the Predators came alive in the third period scoring four unanswered goals to win by a 6-4 margin. Granted, the Thrashers changed goalies but the Preds got the shot in the arm they needed after the first period nightmare. Kudos go to Pekka Rinne for recovering from the potential damage to his self esteem in the first period scoring surge and to Jordan Tootoo who was the first star of the game. The Preds broadcast team felt Pekka Rinne actually had one of his best games yet by stepping and keeping the Preds in the game through the last two periods. Tootoo continued to show the hockey world his continued development as a skill player by once again notching a “Gordie Howe Hat Trick”. In addition to his 2nd period pugilism, Tootoo had a goal and two assists. The win leaves the Preds with a 2-3 record heading into the preseason finale Sunday at Carolina. Preds Fall To Carolina 4-2. Jordan Tootoo and Greg Zanon Celebrate after Vern Fiddler's third period goal. The Preds fell to Caroline last night 4-2. Last night we were mixing up the lines to see who did good with who. This was one of the main reason we looked awful in the 1st and 2nd period. Dan Ellis was having a tough time last night keeping the puck out of the net. He let two easy ones get by him right at the start of the game. That gave Carolina the momentum to get a good start. Every goal that went in should’ve been stopped.. I’m surprised Trotz didn’t put Pekka Rinne in after the 3rd goal in the 2nd period. Although Ellis did make a few HUGE saves. The Preds only managed to get in two goals last night. The first Pred’s goal was scored by Joel Ward. He got a good feed from Shea Weber and blew it past Cam Ward. The same thing happened during the first pre-season game, except he completely blew that one. The second goal was scored by Vern Fiddler from Greg Zanon and Ville Koistinen. I was unable to see this goal because I was out in the hall trying to get back to our seats. I apologize for this. Every single one of our defensemen got over 20 minutes of ice time. Last night was Ville Koistinen’s first game back since last season. He had an assist and a few hits. He’s always brought a solid effort to the table. Radek Bonk only played 6:48 last night. I don’t know if he was hurting or what but he ended out the night with a +1 and a majority of wins on faceoffs. Antti Pihlstrom only got 11:48 ice time last night. That’s suprising. Our power play again was terrible. We weren’t taking our shots. We were sitting back passing the puck back and forth. Why do they not work on this? It should be our main concern going into this season. Our penalty kill did pretty good killing off a 5-3 during the second. Though we did let one get by us on the 5-4. Overall pretty solid performance from our penalty killers last night. The overall game last night was a bit of a drag to watch for the first two periods. They need to work with these new lines a lot. I think the lines they had going last night will be really decent once they get the chemistry going. Josh Gratton and Trevor Gillies go at it early in the first period in the Predator- Hurricane game at the Sommet Center on October 2, 2008 in Nashville. Both players are competing for enforcer positions with their respective clubs. Last week I reviewed the Predators situation in Goal and on the blue line looking at who would be on the final roster. This week I will wrap up the roster analysis taking a look at the possibilities at forward and at the enforcer position. Before moving into new ground this week, the Preds made expected cuts on defense and in goal. The remaining Goalie that appears headed for Milwaukee is Drew MacIntyre, leaving Eliis and Rinne as the last tandem standing. On defense, there are eight players left with an assumed seven roster spots. The final cut appears to be a competition between Kevin Klein and Aleander Sulzer. Since Klein would have to clear waivers and considering the fact the Preds never allowed him to pass through the process last year (carrying eight d-men all year) it would seem certain that they wouldn’t risk losing him at this point. Sulzer appears headed down and will be available for an injury call up along with Franson, Lasko, and Dietrich. We now move to new territory with the forwards. The Predators have an abundance of young talented players that appear ready to play at least part of the season at the NHL level. There appears to be 18 uninjured forwards competing for a possible 14 open roster spots. Neither the injured Jed Ortmeyer nor Steve Sullivan appear even worthy of discussion at this point. Sullivan has played his last NHL game (whether he realizes it or not) and Ortmeyer has issues with blood clotting that won’t resolve anytime soon. Former Sabre Mike Ryan, who was in camp on a tryout, appeared to have been in the mix but abruptly left camp on Monday. Nine players appear to be a lock for a roster spot including Jason Arnott, J P Dumont, Marty Erat, David Legwand, Jordan Tootoo, Scott Nichol, Vern Fiddler, Jered Smithson and Radek Bonk. That leaves nine players competing for a presumed 5 open slots. Of the nine, there are two distinct groups. One group would include the three enforcer type players – Tristin Grant, Josh Gratton and newly acquired Nick Tarnasky. 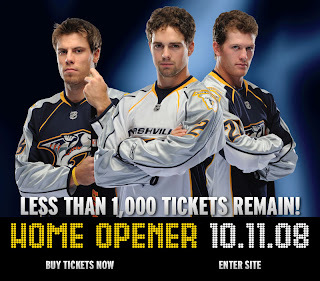 I seriously doubt that the Preds will keep more than one of these three on the roster. Although he has been slowed by an injury, Tarnasky appears to be the odds on favorite to make the squad. I still don’t understand why David Poile made the deal for Tarnasky but I doubt that he would have had he not intended to play him at the NHL level. Of the three enforcers, Tarnasky has the most experience and would have to clear waivers to be sent down. I could fantasize of a 2008 version of the Hanson brothers with all three tough guys on a line but it’s not going to happen. I feel certain in saying, Tarnasky is in and Grant and Gratton will be waiting in Milwaukee busting heads along with recent cut Kelsy Wilson. That’s not a group you’d want to run into after you had brushed the Admirals goalie a little too hard. With the enforcer position filled, that leaves six skill players going for four spots. Rich Peverly probably has a spot. He played well enough last year filling in for the Preds and making the AHL All-star team while in Milwaukee. He was a solid contributor and scored several key goals. Patric Hornquist is another one who will have a slot. After playing well in the Swedish Elite league and the World Championships he has been as good as advertised so far. He probably would have made the squad last year had he not been committed to return to his prior team and with Alexander Radulov suspended, his scoring touch is sorely needed in Nashville. Antti Philstrom also appears to have the inside track on a slot in Nashville. His hustle, quickness and gritty style has won the praises of coaches and fans alike. Personally, he is an early leader to become my favorite Predator player (Sorry Scotty Nichol, you are still in the top two). The odd man out in this group appears to be Joel Ward. The coaches have really liked his game but have basically ruled out the opening day roster. He will be an early injury call up for an energy or grinder line spot. The Last spot will be decided in the next three preseason games between newcomer college star Ryan Jones and organization prospect Cal O’Reilly. This will be a tough decision for the coaches, as both have played well and impressed so far. O’Reilly was slowed by injury and missed the early part of camp but has come on strong since returning. Jones is straight out of college and has never played a long season before. The staff really likes his size and ability to play in front of the goal a la Thomas Holstrom and that is something the Preds have never had. When possible, the Predators have always wanted the road to Nashville to go through Milwaukee. Not since Scott Harnell in the early years has Polie brought a player straight into the league. My gut feeling is that this may be the year he does it twice with both Jones and Hornquist. So in Summary, barring trades or injury, here’s your 2008-2009 Nashville Predator Opening day roster. You heard it here first. Forwards - Arnott, Dumont, Erat, Legwand, Tootoo, Nichol, Fiddler, Smithson Bonk, Peverly, Hornquist, Philstrom, Jones and Tarnasky.